This article is about the 2006 film. For other uses, see Happy Feet (disambiguation). Happy Feet is a 2006 Australian-American computer-animated musical fantasy film directed, produced, and co-written by George Miller. It stars Elijah Wood, Robin Williams, Brittany Murphy, Hugh Jackman, Nicole Kidman, Hugo Weaving, and E.G. Daily. It was produced at Sydney-based visual effects and animation studio Animal Logic for Warner Bros., Village Roadshow Pictures, and Kingdom Feature Productions and was released in North American theaters on November 17, 2006. It is the first animated film produced by Kennedy Miller in association with Animal Logic. Though primarily an animated film, the film does incorporate motion capture of live action humans in certain scenes. The film was simultaneously released in both conventional theatres and in IMAX 2D format. The studio had hinted that a future IMAX 3D release was a possibility. However, Warner Bros., the film’s production company, was on too tight a budget to release Happy Feet in IMAX digital 3D. Happy Feet won the Academy Award for Best Animated Feature, a first for Warner Bros., as well as the BAFTA Award for Best Animated Film. It was nominated for the Annie Award for Best Animated Feature and the Saturn Award for Best Animated Film. A sequel, Happy Feet Two, was released into theaters November 18, 2011 and received mixed reviews. Every emperor penguin sings a unique song called a "heartsong" to attract a mate. If the male penguin's heartsong matches the female's song, the two penguins mate. Norma Jean, a female penguin, falls for Memphis, a male penguin and they become mates. They lay an egg, which is left in Memphis' care, while Norma Jean leaves with the other females to fish. While the males struggle through the harsh winter, Memphis briefly drops the egg. The resulting chick, Mumble, is unable to sing but can tap dance. Nevertheless, he is enamored with Gloria, a female penguin who is regarded as the most talented of her age. One day, Mumble encounters a group of hostile skua, with a leader who is tagged with a yellow band, which he says is from an alien abduction. Mumble narrowly escapes the hungry birds by falling into a crevice. Now a young adult, Mumble is frequently ridiculed by the elders. After escaping from a leopard seal attack, Mumble befriends a group of Adelie penguins called "the Amigos", who embrace Mumble's dance moves and assimilate him into their group. After seeing a hidden human excavator in an avalanche, they opt to ask Lovelace, a rockhopper penguin, about its origin. Lovelace has the plastic rings of a six pack entangled around his neck, which he claims to have been bestowed upon him by mystic beings. For the emperor penguins, it is mating season and Gloria is the center of attention. Ramón, one of the Amigos, attempts to help Mumble win her affection by singing a Spanish version of "My Way", with Mumble lip syncing, but the plan fails. In desperation, Mumble begins tap dancing in synch with her song. She falls for him and the youthful penguins join in for singing and dancing to "Boogie Wonderland". The elders are appalled by Mumble's conduct, which they see as the reason for their lean fishing season. Memphis begs Mumble to stop dancing, for his own sake, but when Mumble refuses, he is exiled. Mumble and the Amigos return to Lovelace, only to find him being choked by the plastic rings. Lovelace confesses they were snagged on him while swimming off the forbidden shores, beyond the land of the elephant seals. Not long into their journey, they are met by Gloria, who wishes to join with Mumble as his mate. Fearing for her safety, he ridicules Gloria, driving her away. At the forbidden shore, the group finds a fishing boat. Mumble pursues it solo to the brink of exhaustion. He is eventually washed up on the shore of Australia, where he is rescued and kept at Marine World with Magellanic penguins. After a long and secluded confinement in addition to fruitlessly trying to communicate with the humans, he nearly succumbs to madness. When a girl attempts to interact with Mumble by tapping the glass, he starts dancing, which attracts a large crowd. He is released back into the wild, with a tracking device attached to his back. He returns to his colony and challenges the will of the elders. Memphis reconciles with him, just as a research team arrives, proving the claims of the existence of "aliens" to be true. The whole of the colony, even Noah the leader of the elders, engages in dance. The research team returns their expedition footage, prompting a worldwide debate. The governments realize they are overfishing, leading to the banning of all Antarctic fishing. At this, the emperor penguins and the Amigos celebrate. Elijah Wood, Robin Williams, Brittany Murphy and Nicole Kidman at the film's European premiere in London, UK. Happy Feet was also partially inspired by earlier documentaries such as the BBC's Life in the Freezer. In 2001, during an otherwise non-sequitur meeting, Doug Mitchell impulsively presented Warner Bros., studio president Alan Horn with an early rough draft of the film's screenplay, and asked them to read it while he and Miller flew back to Australia. By the time they'd landed, Warner had decided to provide funding on the film. 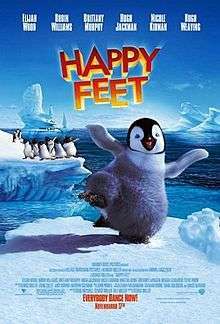 Production was slated to begin sometime after the completion of the fourth Mad Max film, Fury Road, but geo-political complications pushed Happy Feet to the forefront in early 2003. An earlier cut of the film seems to have included a large subplot regarding aliens in the extraterrestrial sense, whose presence was made gradually more and more known throughout, and who were planning to siphon off the planet's resources gradually, placing the humans in the same light as the penguins. At the end, through the plight of the main character, their hand is stayed and, instead, first contact is made. This was chopped out during the last year of production, and has yet to see the light of day in a finished form, although concept art from these sequences were showcased at the Siggraph 2007 demonstration, and are available online, as well. The animation is invested heavily in motion capture technology, with the dance scenes acted out by human dancers. The tap-dancing for Mumble in particular was provided by Savion Glover who was also co-choreographer for the dance sequences. The dancers went through "Penguin School" to learn how to move like a penguin, and also wore head apparatus to mimic a penguin's beak. Happy Feet needed an enormous group of computers, and Animal Logic worked with IBM to build a server farm with sufficient processing potential. The film took four years to make. Ben Gunsberger, Lighting Supervisor and VFX Department Supervisor, says this was partly because they needed to build new infrastructure and tools. The server farm used IBM BladeCenter framework and BladeCenter HS20 blade servers, which are extremely dense separate computer units each with two Intel Xeon processors. Rendering took up 17 million CPU hours over a nine-month period. According to Miller, the environmental message was not a major part of the original script, but "In Australia, we're very, very aware of the ozone hole," he said, "and Antarctica is literally the canary in the coal mine for this stuff. So it sort of had to go in that direction." This influence led to a film with a more environmental tone. Miller said, "You can't tell a story about Antarctica and the penguins without giving that dimension." The film was dedicated to the memory of Nick Enright, Michael Jonson, Robby McNeilly Green, and Steve Irwin. Happy Feet is a jukebox musical, taking previously recorded songs and working them into the film's soundtrack to fit with the mood of the scene or character. Two soundtrack albums were released for the film; one containing songs from and inspired by the film, and another featuring John Powell's instrumental score. They were released on October 31, 2006 and December 19, 2006, respectively. The film opened at #1 in the United States on its first weekend of release (November 17-19) grossing $41.6 million and beating Casino Royale for the top spot. It remained #1 for the Thanksgiving weekend, making $51.6 million over the five-day period. In total, the film was the top grosser for three weeks, a 2006 box office feat matched only by Pirates of the Caribbean: Dead Man's Chest. As of June 8, 2008, Happy Feet has grossed $198.0 million in the U.S. and $186.3 million overseas, making about $384.3 million worldwide. Happy Feet was the third highest grossing animated film in the U.S., behind Cars and Ice Age: The Meltdown. The film has been released in about 35 international territories at the close of 2006. The production budget was $100 million. Happy Feet received generally positive reviews from critics. On review aggregator site Rotten Tomatoes, the film has a 75% "Certified Fresh" score based on 161 reviews, with an average rating of 6.9/10. The site's consensus was "Visually dazzling, with a thoughtful storyline and catchy musical numbers, Happy Feet marks a successful animated debut from the makers of Babe." Metacritic reports a 77 out of 100 rating, based on 30 critics, indicating "generally favorable reviews". The film has also garnered, since its release, quite a bit of analysis and dissection from various places. Film critic Yar Habnegnal has written an essay, published in Forum on Contemporary Art and Society, that examines the themes of encroachment presented throughout the film, as well as various other subtexts and themes, such as religious hierarchy and interracial tensions. And, Vadim Rizov of the Independent Film Channel sees Mumble as just the latest in a long line of cinematic religious mavericks. On a technical or formal level, the film has also been lauded in some corners for its innovative introduction of Miller's roving style of subjective cinematography into contemporary animation, among other things. Happy Feet was released on home media on March 27, 2007 in the United States in three formats; DVD (in separate widescreen and pan and scan editions), Blu-ray Disc, and an HD DVD/DVD combo pack. Among the DVD's special features is a scene that was cut from the film where Mumble meets a blue whale and an albatross. The albatross was Steve Irwin's first voice role in the film before he voiced the elephant seal in the final cut. The scene was finished and included on the DVD in Irwin's memory. This scene is done in Irwin's classic documentary style, with the albatross telling the viewer all about the other characters in the scene, and the impact people are having on their environment. "HAPPY FEET is a one-of-a-kind motion picture experience. George Miller continues to paint outside the lines of traditional filmmaking, and his genius expands upon the animated art form to illuminate a world where penguins embrace dance and differences to survive and thrive. But that is just the tip of the iceberg, as the environment, religion and the chasm between generations enrich this sweet and subtle tale – one that is fun and funny, brilliant and beautiful, groundbreaking and global in its message." A video game based on the film was developed by A2M and published by Midway Games. It has the same main cast as the film. It was released for the PC, PlayStation 2, GameCube, GBA, NDS, and Wii. Artificial Life, Inc. has also developed a mobile game for the Japan market. Happy Feet Two was produced at Dr. D Studios and released on November 18, 2011. Wood and Williams reprised their roles for the sequel. Murphy was set to reprise her role and begin recording sometime in 2010, but died from pneumonia on December 20, 2009. Matt Damon and Brad Pitt signed on as Bill the Krill and Will the Krill respectively. In an interview with Collider.com, Miller mentioned the small possibility of Happy Feet Three, stating that if he came up with an idea for a third film, that he and his studio would produce it if they both agreed the idea was better than the first two. As of now, however, he has yet to mention if he has any ideas for a third film since the interview. Happy Feet 4-D Experience is a 12-minute 4D film shown at various 4D theaters over the world. It retells the condensed story of Happy Feet with the help of 3D projection and sensory effects, including moving seats, wind, mist and scents. Produced by SimEx-Iwerks, the 4D experience premiered in March 2010 at the Drayton Manor Theme Park. Other locations included Sea World (2010–2011), Shedd Aquarium (2010–2012), Moody Gardens (2010–2011), Nickelodeon Suites Resort, and Adventure Aquarium. March of the Penguins — A 2005 nature documentary film about the real life emperor penguins. It won the 2005 Academy Award for Best Documentary Feature.). ↑ "Film Distribution - Village Roadshow Limited". Village Roadshow Pictures. February 11, 2014. Retrieved February 11, 2014. 1 2 Happy Feet (2006). Box Office Mojo. Retrieved January 2, 2011. ↑ "Happy Feet: The IMAX Experience". IMAX. Retrieved 15 March 2007. ↑ "Happy Feet Won't Debut in IMAX 3-D". VFXWorld. Retrieved March 15, 2007. ↑ "The filmmaker behind the 'Mad Max' and 'Babe' franchises turns his attention to musical fowl". In Focus. Retrieved November 13, 2010. ↑ "Penguin suits up for a cinema hit". The Australian. Retrieved March 28, 2008. ↑ (August 6, 2007). Live from the Happy Feet discussion at Siggraph 2007. Retrieved November 13, 2010. ↑ Savion Glover (2007). Happy Feet (DVD). Warner Brothers. ↑ Kelley Abbey (2007). Happy Feet (DVD). Warner Brothers. ↑ "Animal Logic builds rendering farm with IBM eServer BladeCenter". IBM Australia. Retrieved February 1, 2010. ↑ Kelly, Kate (17 November 2006). "The New Animated Film Happy Feet Doesn't Dance Around Serious Issues". The Wall Street Journal. Retrieved March 15, 2007. ↑ Weekend Box Office Results for November 17–19, 2006. Box Office Mojo. Retrieved November 13, 2010. ↑ Happy Feet (2006) - Weekend Box Office Results. Box Office Mojo. Retrieved November 13, 2010. ↑ IMDb Charts. IMDb. Retrieved November 13, 2010. ↑ Weekend Box Office Results for February 1–3, 2008. Box Office Mojo. Retrieved November 13, 2010. ↑ "Happy Feet (2006)". Rotten Tomatoes. Retrieved November 13, 2010. ↑ "Happy Feet reviews". Metacritic. CBS Interactive. Retrieved March 29, 2016. ↑ Yar Habnegnal on Happy Feet. Scribd.com. Retrieved November 13, 2010. ↑ "Happy Feet (2006) - Elijah Wood, Nicole Kidman, Hugh Jackman". Retrieved January 2, 2011. ↑ "Happy Feet to Dance on Blu-ray, HD DVD This March | High-Def Digest". Retrieved January 2, 2011. ↑ Golden Trailer Awards. Retrieved 2 January 2011. ↑ "AFI's 10 Top 10 Nominees" (PDF). Retrieved 2016-08-19. ↑ "Film Critic Top Ten List, 2006 Critics' Picks". Retrieved January 2, 2011. ↑ "The Critics". Retrieved January 2, 2011. ↑ Happy Feet. Midway.com. Retrieved January 2, 2011. ↑ (2007-04-24). Parthajit; "Happy Feet Goes Mobile". Softpedia. Retrieved January 2, 2011. ↑ "About Dr. D Studios". Retrieved November 13, 2010. ↑ Byrnes, Holly; Crawford, Carly (December 21, 2009). "Brittany Murphy planned to have New Year in Australia". News.com.au. Retrieved December 17, 2012. ↑ (January 19, 2010). "Matt Damon, Brad Pitt to Voice Characters in Happy Feet Sequel". ShowbizSpy.com. Retrieved November 13, 2010. ↑ "Happy Feet 2's first look at Pitt, Damon". RTÉ Ten. September 30, 2011. Retrieved October 13, 2011. ↑ Christina Radish (November 16, 2011). "Director George Miller Talks HAPPY FEET TWO, MAD MAX, and JUSTICE LEAGUE". collider.com. Retrieved January 21, 2012. ↑ "Drayton Manor to open Happy Feet 4D attraction on March 20". Theme Park Tourist. March 2, 2010. Retrieved December 10, 2010. ↑ "Happy Feet 3-D (Sea World)". Parkz. Retrieved July 14, 2013. ↑ "4D Theater". Shedd Aquarium. Archived from the original on December 10, 2010. Retrieved December 10, 2010. ↑ "Virtual Reality Theater". Moody Gardens. Archived from the original on December 10, 2010. Retrieved December 10, 2010. ↑ "Orlando Theater and 4-D Experience". Nickelodeon Suites Resort. Archived from the original on December 10, 2010. Retrieved December 10, 2010. ↑ "4D Theater". Adventure Aquarium. Archived from the original on December 10, 2010. Retrieved December 10, 2010. ↑ "NY Times: March of the Penguins". The New York Times. Retrieved November 23, 2008. Wikimedia Commons has media related to Happy Feet.